The Wii nunchuck is really important for playing Wii games. I say it's the second most important controller for the Wii console because it's not as much fun as the Wii remote. In reality though you'll need the nunchuck to play nearly every Wii game. In most video games you control the main character. This means moving your character around the game and performing actions. The Wii nunchuck controller is the joystick that moves your characters around the game. The Wii remote is the controller you'll use to perform the actions. So how do you use these two Wii controllers together…? Both the nunchuck and the Wii remote are wireless. They don't have any wires connecting them to the actual Nintendo Wii console. The nunchuck does have a very short wire that simply plugs into the Wii remote controller. The Wii nunchuck doesn't even need any batteries. To use the nunchuck controller you simply plug it into the Wii remote, and the nunchuck is powered by the Wii remote controller's batteries. The nunchuck won't work if it's not plugged into the small connector on the back of the Wii remote. 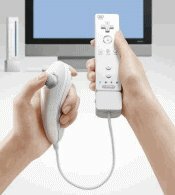 To play a game, you hold the nunchuck in one hand and the Wii remote in the other. Both controllers are small in size and are easy for even children to hold. The nunchuck has a small joystick on the top of it. The joystick is perfectly positioned so that you can easily use your thumb to move it around. Moving the joystick to the right makes your character on the screen move right. Moving the joystick upwards makes your character move upwards on the screen. The nunchuck also has a button on the front of it. This button is used in some Wii games to perform small actions. As an example your character might be walking along using the joystick and you'll press the small button to open a door. Like the Wii remote, the Nintendo Wii console only comes with one nunchuck packaged in the box. So you'll need to buy an extra nunchuck if you're going to be playing your Wii with friends and family. In my article on the Wii remote controller, I explained why it was a good idea to buy one spare Wii remote if you're going to be playing games with your friends. As I mentioned earlier, most games need you to use both of these Wii controllers at the same time to play. The nunchuck controller is reasonably cheap (around $20 in the US and £15 in the UK) and is about half the price of the Wii remote. With this lower price, my recommendation is to buy an extra nunchuck controller at the same time you buy an extra Wii remote (especially if this saves on delivery charges). This lets you and your friends play together from the beginning, without any problems. As I recommended in my Wii remote article, only buy one extra Wii nunchuck at this stage. If you really need more Wii controllers further down the line, you can always purchase them later. But for now, one extra Wii nunchuck will do fine.